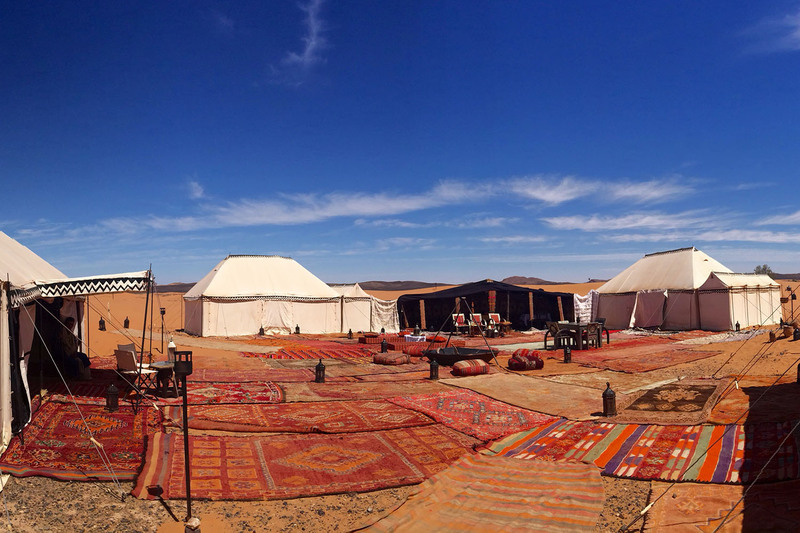 Desert Luxury Camp is located in Erg Chebbi sand dunes by Merzouga in Morocco. These golden sand dunes climb to the heights of 150m and have incredible wow aspect upon seeing them. The camp is nestled right in the dunes, easily reach by 4x4WD, camels or helicopter. After a 4X4 drive, stopping several times to see a nomads’ camp, then some fossils, I arrived at the Desert Luxury Camp by camel, guided there by the charming young cameleteer. I was greeted by cobalt blue turbaned djellaba men, with mint tea and nibbles and was then ushered back to the 2 camels for a ride to the top of the dunes to watch the sunset. The colours of the sand were ever changing, and what struck me was the silence all around us. Just stunning. 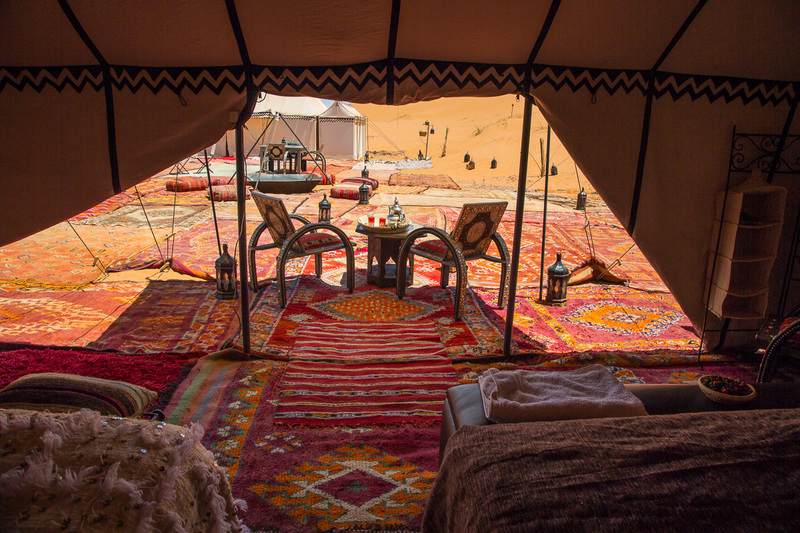 The Desert Luxury Camp itself is outrageously beautiful and very decadent with candles and silks everywhere. My own traditional caidal tent was beautifully decorated with blackwork on the exterior and stripped bold colours on inside, a thick pile rug and electric lighting in the ceiling as well as ambient lamps. Bathrooms, which are in another tent attached to the sleeping tent, have a hand held shower, toilet and beautiful fossil sink. It made me wonder how the plumbing worked in the middle of nowhere?! The beds are huge and very comfy and to be able to use a proper toilet and have a hot shower in the desert is really amazing. The candle lit dinner with wine, was prepared beautifully by the Berbers and with exquisite presentation, and was served under the stars. It was both special and tasty. It was followed by camp fire and music until it was late. I couldn’t have felt more pampered. We were then given hilarious black long cloaks to sit outside our tent and stargaze by the camp fire. It was oh so romantic…. This was early October. I read that it gets cold in the desert so I brought warm clothes & a jacket, however, the temperature remained warm until the late evening. The desert breeze cooled us outside. Inside the tent was hot with no air conditioning but there were 2 windows which had flaps that you could open to let the air in. It must have been in the middle of the night when it got cool (not cold) and I found myself reaching for the covers. The weather in the early morning was cool and comfortable. I woke up at the crack of dawn and climbed the dunes to watch the sunrise. Spectacular! I then had time to wander across the dunes. The colours of the sand were even more beautiful in the morning and you could guess which little animals had been visiting during the night!It was fun to walk on the Sahara sand. When I walked back to camp, breakfast (alfresco) was ready. Fantastic! Dozen of extreme-ish activities are offered from the Desert Luxury Camp during the day, from sand boarding, camel treks , quad biking or guided walks to slow pace such as yoga, sunset /sunrise watching or star gazing at night. On departure from the beautiful Desert Luxury Camp, camels picked everyone up for the hour ride back. Although you could opted to take the fun but bumpy 4X4 instead. I was sorry to say goodbye. 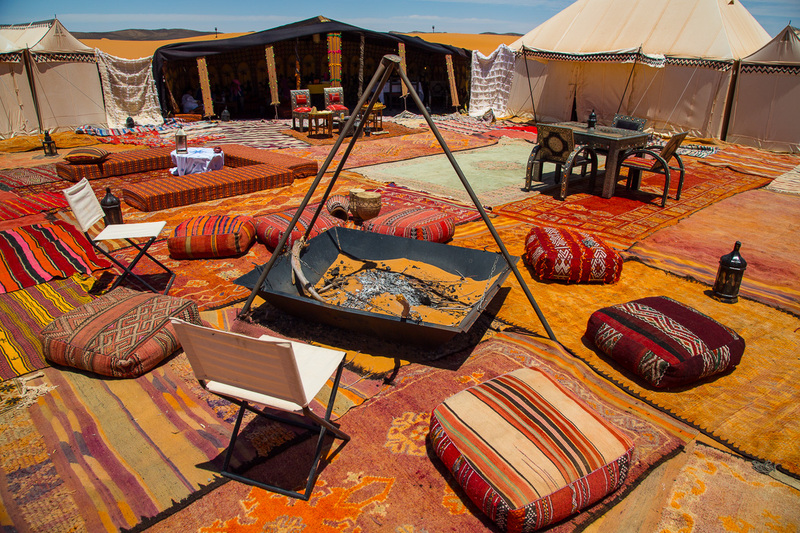 The Desert Luxury Camp is an experience that you simply must try. An absolute once in a life time and an unforgettable experience.